Sinn Féin launches alternative budget, say "Government still have choices"
Sinn Féin outlined its own alternative budget entitled “Making the Right Choices” today, which it said would also save government the required €3.5 billion. 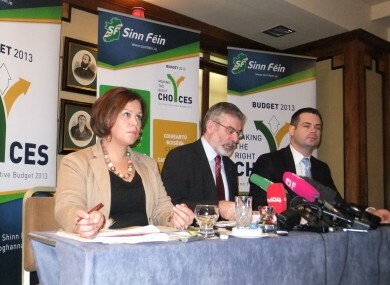 Mary Lou McDonald, Gerry Adams and Pearse Doherty at today's alternative budget launch. SINN FÉIN TODAY announced its alternative recommendations for the upcoming budget on 5 December. Making reference to the “five gruelling, cruel austerity budgets” that have gone before, Sinn Féin leader Gerry Adams said that it was their “strong view” that citizens had had enough. Describing today’s publication as building on the jobs plan that they launched last year, they also committed to launching proposals on the banking sector early next year which would deal with “curtailing bankers pay and getting banks lending again”. Budgets are about choices. Do you introduce a property tax that calls on struggling households to pay more or do you introduce a wealth tax that asks the most well off to pay more? Do you cut Child Benefit or do you cut politicians’ and high paid civil servants’ wages? Do you protect tax reliefs for those who can afford to avail of them or do you reduce the cost of petrol and diesel for everyone? These are the choices the government has before it. For my party the choices are obvious. Outlining the alternatives, Doherty said that all costing had been independently verified via parliamentary questions, with “the exception of the wealth tax”. Proposed taxes, totalling €2.758 billion, would be recouped by implementing a one per cent wealth tax on net wealth over €1 million, “excluding business assets, working farms, pension pots and 20 per cent of the family home,” which would bring in €800 million. A further “wealth tax” would see capital gains tax increase from 30 to 40 per cent, at a saving of €160 million. A similar increase in capital acquisitions tax from 30 to 40 per cent (with thresholds reduced by 25 per cent ) would also save €150 million. “On the tax side, we have concentrated on sections of society which we believe can afford to pay more,” Doherty said. In line with this, he proposed a third rate of tax, at 48 per cent, which would apply to individual incomes over €100,000, saving €365 million. A third rate of PRSI, at 15.75 per cent, which would apply to employers on income paid over €100,000 would also save €91.5 million. While promising to “maintain all discretionary tax reliefs,” Doherty said that their standardisation, with the exception of charitable donations, would bring in just under one billion (€969 million). Landlords would have their mortgage interest deduction reduced from 75 per cent to 40 per cent, saving €157 million, while applying PRSI to rental income would bring in a further €20 million. “Super pensions” would be taxed further, while pension-related salary earnings would be capped at €75,000. A new five per cent tax on gambling, which would be paid by consumers, would bring in €243.5 million. Proposed changes that would put more money in peoples’ pockets included reducing the excise on petrol and diesel by five per cent, would bring in €177.7 million less. Removing payment of the Universal Social Charge (USC) for those on minimum wage would also cost government €131 million. A change in tax adjustments to allow for the capping of public salaries would cost a further €115 million. Proposed savings, totalling €1.044 billion, are outlined below. A social welfare amnesty would save €55 million, with proposals to recoup social welfare payments from employers who had been found to have wrongfully dismissed an employee saving €12 million. Health savings of €432.5 million would be made by making those who avail of private health care in public hospitals pay full price, while using more generic medicines would save €280 million. Dropping the subisdy for private schools would recoup €22 million. The introduction of a pay cap of €100,000 in both the civil and public service would save €102 million. Proposals also included the capping of the salaries of VEC chiefs, City and County managers, and non-commercial CEOs at €100,000 for three years. Total savings: €4,373,201. Withdrawing the current Secretary General TLAC (special severance pension payment) would save €1.6 million while capping the pay of hospital consultant’s at €150,000 for three years would yield savings of €90 million. Finally, reducing the board fees of all state agencies by 25 per cent would save government 6.5 million. Sinn Féin proposals include cutting government salaries to €100,000, TD’s to €75,000 and that of Senator’s to €60,000, which would save 4.3 million. Abolishing Dáil and Seanad allowances, committee chairperson’s allowances and the allowances of super junior minister allowances would save a total of €599,879. Removing Houses of the Oireachtas commission payments would save €76,000 while capping the pay of special advisors to ministers would save nearly half a million. Finally, scrapping the mobile phone allowance of Oireachtas members would save €113,000. Miscellaneous proposals included cutting the government’s jet spending by 15 per cent and cutting professional fees by the same percentage. Savings in telecommunications would total €2.29 million while increasing the public sector pension reduction for high earners would recoup a further €10 million. Email “Sinn Féin launches alternative budget, say "Government still have choices"”. Feedback on “Sinn Féin launches alternative budget, say "Government still have choices"”.